Basic Columbus brings you Splash Pad Numero Dos. We will just admit it right off the bat. 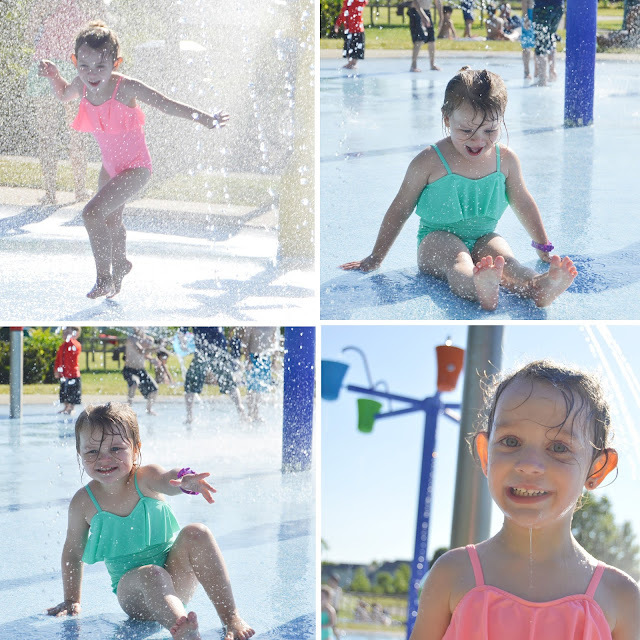 We are pretty sure this splash pad takes the cake as our favorite splash pad. Upper Arlington we could be persuaded if you built a similar but better one. Awkwardly looking at you again UA. The area is beautiful to begin! Located quaintly in downtown Powell the splash pad sits back away from the roads among lots of gorgeous green space. There is LOTS of shade! Not just fountains. I mean look at it! It just looks fun. And kids think so too! They haven’t met a splash pad they don’t like. · Way more than just fountains. This splash pad comes equipped with interactive equipment, brightly colored structures to run through and under. · Easy and plenty of parking. · Shade. TONS of provided shade. There is a large shelter area that houses numerous picnic tables and a soda machine, creating plenty of space to sit down and spread out. · No concern of running into streets or traffic, the park and splash pad are located far enough away from all main roads. · Gorgeous entertainment area that the City of Powell utilizes to host all kinds of family friendly events year round. · A dry playground not more than a hop, jump, and a skip away from the splash pad, really providing two attractions for overly eager kids. · Cruz Candy store within walking distance to the spray-ground. Check this place out, its really neat! · We might complain about every restroom location we come across. Just go with it. They, again, are not super far, but far enough that you will have to leave the splash pad area and take your eyes off little brother or sister. Cue dragging more than one kid away from the splash pad. Not winning. · There is a beautiful pond that sits on the property. It’s beautiful and we enjoyed it. While we are pretty sure there are not any alligators in it, if you have a little fisherman you may want to keep an extra close eye that they don’t end up in the pond rather than on the splash pad! · The on-site playground was a HUGE PRO until we had to chase our kids into it. Which resulted in us having to go down slides to get out of it. It’s slightly awkward with no clear entry way for adults from the splash pad into the playground. You either have to walk all the way around it or go down the slides. We don’t really do slides anymore, so we ended up climbing through the bushes. Powell really thought things through when they put the playground directly next to the splash pad. It’s like having two attractions in one place. 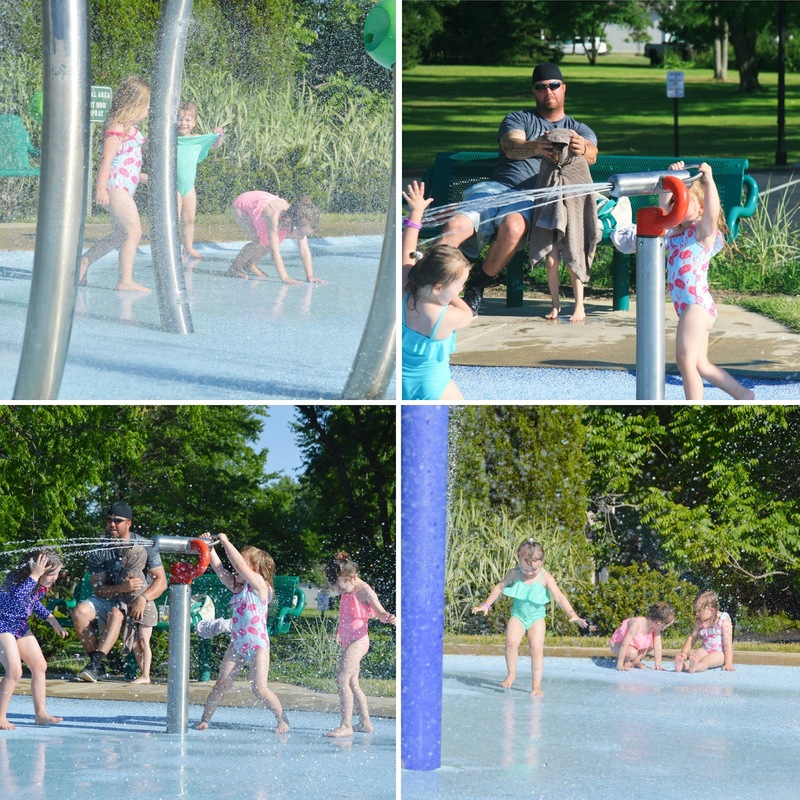 When there are things for the kids to play with at the splash pads we hear a lot less, “Mom, come play with me!” Which we appreciate more than we probably should. The City of Powell’s Parks & Recreation puts on some great events through out the summer for kids and families. The last Lolli-Pops Children’s Concert series takes place on August 1st beginning at 10:30am featuring the Shazzbots. 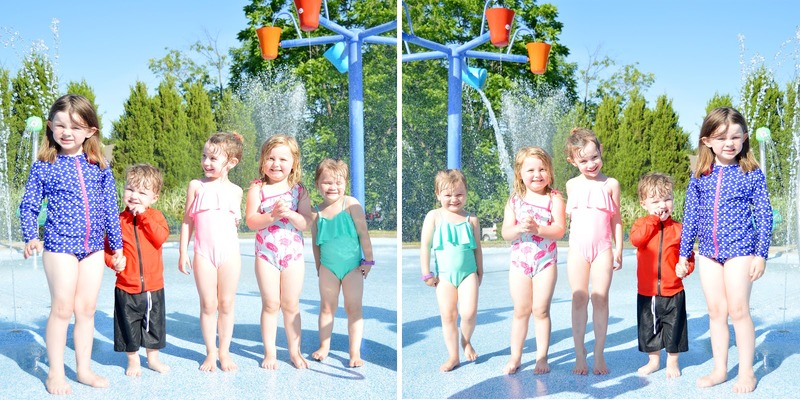 If we asked the girls to review the splash pad they would give it a resounding, MORE MOM MORE! They loved, LOVED the Powell spray-ground. As Mother’s, like we already mentioned we are BIG fans of this splash pad. If you haven’t been to Powell to try it out it is definitely worth the trip! Two Thumbs Up from Basic Columbus!